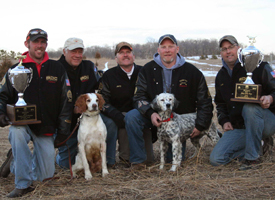 A celebration of Dusty (Brittany Spaniel) and his 2010 BDC Pointer Road Warrior win, as well as Madelyn (Llewellin Setter) and her 2011 BDC Dog of the Year win. Are you looking to give your dog the opportunity to become a champion? Travel with Team Fly-n-Gun. This year, as every year, we will be traveling to various field challenges, hunt tests, and trials throughout Wisconsin and the surrounding states upon request of our clients. We are always looking for a new challenge and enjoy playing all types of bird dog games. What game do you want to play? Competitive events offer a unique experience of new situations, climates, and cover that will aid in building a better, more versatile bird dog. And, don't forget about the fun you and your dog will have in the process. Below are some organizations/events that we have attended with/for our clients. National Bird Dog Circuit Field Challenges. Formally the National Bird Dog Challenge Association (NBDCA). Events occur throughout the United States and are listed at the BDC website. AKC Hunt Tests. AKC hunting tests are designed to showcase what a hunter and his/her hunting companion may be required to do in a typical day's hunt. Tests are set up to measure bird dogs against a set standards rather then a competition between bird dogs. Visit American Kennel Club for a complete listing of hunting tests that occur nation-wide. Field Trials. Field trails are considered the true test of breed standard. Visit American Field for a complete listing of trails that occur nation-wide.